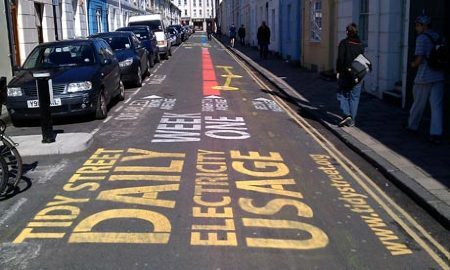 Residents of Tidy Street in Brighton, UK are keeping tabs of their energy consumption by marking their daily usage on the streets. The street infographic, sprayed in chalk, has captured the imagination of locals and people from other places in the world through the Internet, for its effective campaign in encouraging awareness of energy usage in households. Three weeks since the project started, a 15% drop in energy consumption was seen among Tidy Street households. Other households were able to cut down their consumption to 30%. The reductions have been the result of behavioral changes among the participating residents. Locals who were not mindful of how they consumed their electricity became conscious of their energy usage when they started measuring it. Since the project will end at a certain point, project coordinator Jon Bird acknowledges the challenge of maintaining the reductions. The Tidy Street Project is about to enter its second phase which will entail 10 households to record their gas usage in six months.